Blue Group Solutions Named Top Digital Marketing and Web Development Company in Indianapolis! As a full-scale digital agency that offers a broad range of services for our client’s digital needs, we are proud to be recognized by Clutch as leaders in numerous fields. 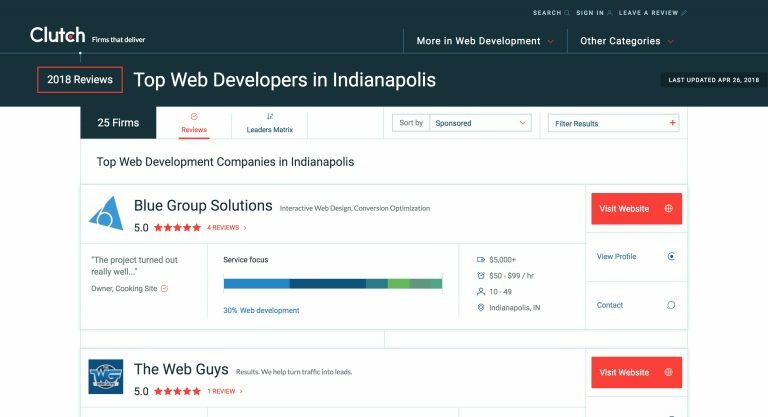 Not only has Blue Group Solutions been identified as a top Indianapolis Digital Marketing Agency, our passionate firm is accredited as the one of the Top Web Developers in Indianapolis. Last November, we shared Clutch’s analysis of Blue Group Solutions’ industry leadership, and now are even more pleased to have stayed on top, especially in our hometown! Clutch is an industry-trusted B2B research firm based in Washington, D.C that analyses businesses across a multitude of sectors and compiles ratings, reviews, and useful data-driven content to foster better business buying and hiring decisions. We’re proud of how we help our clients. We value creating websites for our clients that not only turns clicks into leads, but also foster positive business experiences. Which is why we strongly believe in combining design and programming tools to solve problems, rather than as stand-alone services. We don’t provide services, we deliver solutions with results. Our Clutch profile adds another vital testament to our commitment to our clients’ success.